Contrary to popular belief, rototilling your garden is not a good idea, especially if you do it to the point where the soil is powdery and the ground is completely pulverized. Rototilling does far more harm than good. Healthy soil is full of billions of helpful bacteria, worms, fungi, and microorganisms. Soil also contains a healthy, crumbly structure which has organic matter in various stages of decomposition which allow water, air, and nutrients to be carried to plant roots. When you use a rototiller, healthy soil structure is lost, microorganism activity in the soil is disturbed and killed and essential earthworms are chopped up and their tunnels destroyed. When the original soil structure is lost by rototilling, it loses its ability to drain properly and will get muddy and hard to work in the spring. Healthy soil has air spaces that hold water and allow plant roots to grow; after rototilling, the soil loses its air pockets and becomes compacted which causes plants to underperform. Weeds also become a nightmare with rototilled soil. There are billions of weed seeds buried in the soil, that when brought to the surface, get growing like crazy. 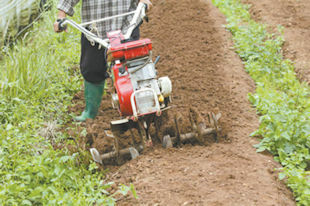 In short, rototilling is a very bad thing that creates a lifeless soil. So what should you do? Take a pitchfork, hoe or shovel, hand loosen the first few inches of the soil and keep it crumbly and lumpy. That's it. Your living soil will thank you and your plantings will thrive.